On January 3, 1787, frontiersman William Sherley Williams was born in what’s now Polk County. Williams moved to the frontier town of St. Louis with his family in the 1790s, and began his career an itinerant Baptist preacher at age 17. Several years later he radically changed the course of his life and become an explorer, trapper, scout and guide. “Old Bill,” as he as commonly known, began his life as adventurer by living among the Osage Indians for more than two decades, adopting their language and customs, marrying a member of the tribe, and learning to be a master fur trapper. During the War of 1812, Williams served as an official interpreter for the U.S. government, and, after the war’s conclusion, helped broker a treaty between the Osage and the federal government. 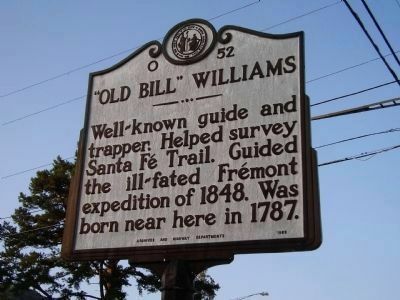 Williams is perhaps best known for scouting and surveying the far western frontier and Santa Fe Trail and for his role in ill-fated Fremont expedition. Williams was blamed for the tragedy that the ended expedition, when 11 men died in a mountain snowstorm from exposure and starvation. In 1849, Williams was killed by Ute warriors while trying to recover some of the equipment lost on the expedition.